An official from the Glen Helen Raptor Center shares a moment with the raptor before he is sent back to the wild. 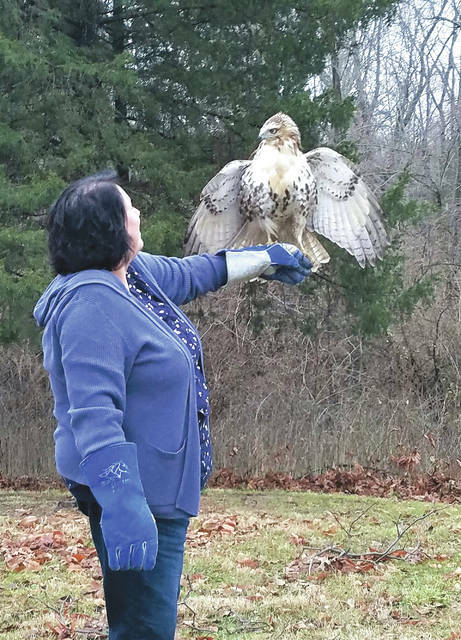 BEAVERCREEK — Taking to the skies after his rehabilitation at the Glen Helen Raptor Center in Yellow Springs, a young red-tailed hawk was released recently at Greene County Parks & Trails’ Russ Nature Reserve in Beavercreek. Russ Nature Reserve offers a mix of 90 acres of woodlands and prairie as habitat for the hawk. The 90-acre park is also home to the Lovely Nature PlayScape, tree identification trail, hiking trails, bee apiary and pond as well as the future home of the Russ multi-purpose events venue. For more information about GCP&T or its Russ Nature Reserve, call 937-562-6440, email info@gcparkstrails.com or visit www.gcparkstrails.com. https://www.beavercreeknewscurrent.com/wp-content/uploads/sites/49/2019/02/web1_49914728_2010887712321736_6172097329835802624_n.jpgAn official from the Glen Helen Raptor Center shares a moment with the raptor before he is sent back to the wild.